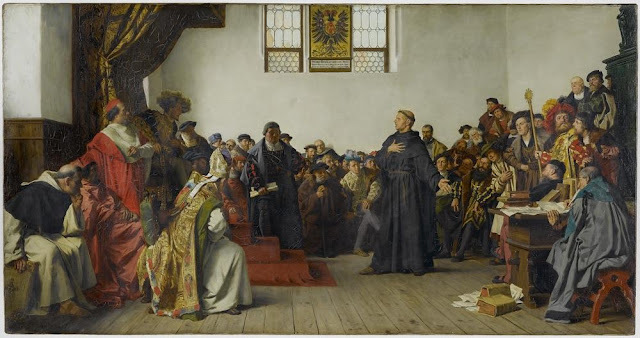 People may have thought that we had the 500th anniversary of the Reformation, considered to have "officially" begun on October 31, 1517 when Martin Luther posted his Ninety-five Theses on the "social media" of his time. Read an article, listen to a message, have a German beer and ride off into the sunset. Not so. As we saw in several posts last year, the Reformation had its beginnings long before that date, and continued afterward. Dr. Albert Mohler had been presenting a series on the Five Solas which I was looking forward to posting in time for the big anniversary observance. Delays happened, so I decided to save them for y'all in time for the 501st anniversary. Before obtaining those, I recommend reading his article, "Here We Stand". They lectures are in MP3 format, so you can download and listen to them at your convenience. Free of charge, naturally. Each link will take you to the page where you can commence to downloading each one. I trust that these will prove edifying and interesting.